For many reasons, I find the history of the cola beverage fascinating. The main reason, though is for its connection to the world-spanning legacy of the timeless bond between humans and medicinal herbs. As slick and commercial as it has become in modern times, that red and white logo of the oldest cola company serves only to remind me that this bastardized sludge I'm drinking is proudly descended in an unbroken line from that first, pure elixir that jolted the minds of the ancients with a new clarity. Recently, I attended the Red Bull Flugtag. The concession stands there were selling something called Simply Cola. Of course I had to try it. The flavor was very unique and I was surprised by the list of ingredients on the can. After that, I tried to find Simply Cola in stores but soon discovered that Las Vegas was the only test market for Red Bull Cola in the USA. So I logged on to eBay and ordered a case. My package arrived this morning. Upon opening it I discovered just a few, tiny 1 oz. sample cans of cola. The rest of the compartments in the crate that should have contained cola held instead cigarette packs and empty cans and bottles. I had been eSwindled! Then I woke up. It was just a dream. My real package arrived that same day and it contained real cans of real cola and I drank them and I was happy. It took me a long time to finally post this article. Now you can find Red Bull Simply Cola at many Plaid Pantries in my town. If you are a fan of caffeine, cola or things like magical snake oil I urge you to seek out Simply Cola at a convenience store near you or even online at Amazon . Also, check out these neat images at LovelyPackage.com. Coca Leaf - Given to the Incas by their creator, Viracocha, coca took away their hunger, gave them strength and erased their miseries. Kola Nut - It's the main source of caffeine in traditional colas. It is said that the consumption of kola produces a more euphoric effect than most other naturally caffeinated plants. In Africa, it is chewed habitually for its stimulant and euphoric effects. Lemon - Historically used as an antidote for some poisons, the lemon can also be used as a battery. Lime - The British Navy provided their sailors with limes for the purpose of preventing scurvy - which is how British sailors came to be known as 'limeys'. Unfortunately, this is not the mineral lime that is traditionally chewed together with coca to activate its alkaloids. Clove - Pure and simple; Cloves numb the pain. Cinnamon - It was a major component of the Holy Anointing Oil that one would need to be covered in before being endowed with the title "Messiah". Oh, cinnamon is also high in antioxidants. Cardamom - It has been used as an antidote for scorpion and snake venom. Pine Nut - A hunger suppressant and possibly the seed that fathered Moctezuma. Corn Mint - A fever reducer, among other things. Galangal - Known as 'Little John' in the deep south, where it was chewed like tobacco and rumored to guarantee victory in court if you spit the juice onto the floor before the judge enters the room. Vanilla - Legend says it originally sprouted from where the blood of a Mexican princess and her lover landed on the forest floor, after they were beheaded by her angry father. Studies show it increases adrenaline. It has also been known as an aphrodisiac. Ginger - Promotes the release of bile from the gallbladder and also helps horses to perform their best in shows: "to feague a horse is to put ginger up a horse's fundament and formerly, as it is said, a live eel, to make him lively and carry his tail well. It is said, a forfeit is incurred by any horse-dealer’s servant, who shall show a horse without first feaguing him." Mace - Research is saying that mace might have anti-cancer properties, but in large doses it is known to cause hallucinations, palpitations and feelings of impending doom. Cocoa - One of the best things ever. Coffee - The other best thing ever. Liquorice - An excellent expectorant, but taking way too much will make your heart explode. Orange - Did you know that an orange is just a big berry? Mustard Seeds - It is known to some as 'Eye of Newt' but is much easier to obtain than that. Despite hundreds of years of bloodshed among them, various world religions can all agree upon the power of the mustard seed. Brilliant. 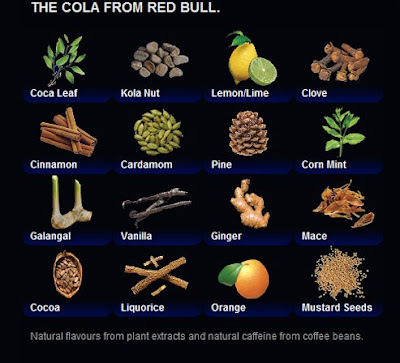 I suspect all these medicinal elements are to keep whatever normal red bull is from devouring your liver.